So I've kind of started a new eating plan. The feature article in February's Real Simple included 30 of the healthiest ingredients dietitians and nutritionists across the country recommend incorporating into your diet. Not necessarily the eat-this-and-you'll-get-skinny ingredients, but healthy because they contain things that are good for you in them. So Caleb and I went to the grocery and came home with 14 of the 30; I figured that was a good start. Sunday I was a little ambitious and put spinach and oats in my fruit and yogurt smoothie. Since that failed breakfast I've chilled out a little and am trying to use the ingredients in ways that I will actually eat them and not pour them down the drain. I made this granola yesterday that had three of the ingredients: old fashioned oats, walnuts, and almonds. All three are good for your cholesterol, the almonds also keep blood vessels healthy, and the oats have soluble fiber and fight against heart disease. This is seriously the best granola I've ever eaten, and I will definitely be making it again. In medium saucepan over medium heat, melt together butter, oil, honey, and brown sugar until the sugar is dissolved and the mixture begins to boil. Carefully whisk together so it's well incorporated. Add the vanilla extract. Pour the warm mixture over the oat mixture and toss together with a wooden spoon. Make sure all of the oat mixture gets moistened by the sugar mixture. *Make sure you use old fashioned oats. I read a lot about granola and using the instant ones will make your granola sandy instead of crunchy. Also, the old fashioned or steel-cut oats are the ones that are healthiest. 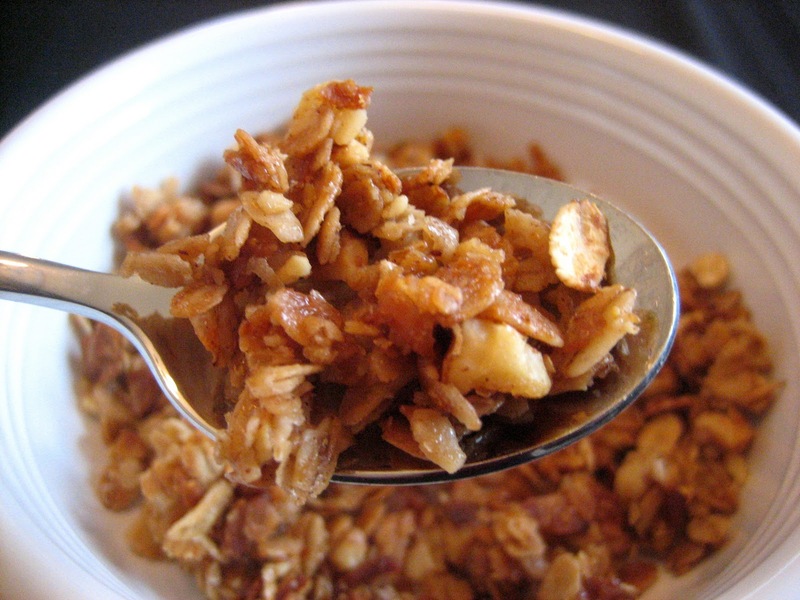 I love homemade granola, there is nothing quite like it! Thanks for the recipe, I can't wait to try it! I love reading your blogs. But, having eaten the carmelitas I prefer them to the granola. I'm not as healthy an eater as you.